Johns Hopkins Univ. Medical Team visits Yes Hospital in Jukjeon, Yongin City in South Korea's Gyeonggi Province on Oct. 7, 2016. 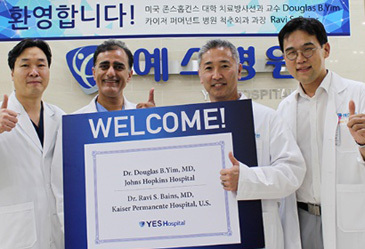 A U.S. medical team, led by Dr. Douglas B. Yim, professor of the Treatment Radiology Department of Johns Hopkins University, and Dr. Ravi S. Bains, chief of the Spine Surgery Department of Kaiser Permanent Hospital, visited Yes Hospital in Jukjeon, Yongin, Gyeonggi Province on Oct. 7, 2016 and observed the SELD (Sacral Epiduroscopic Laser Decompression) procedure, the Yes Hospital announced recently. SLED procedure refers to a developed nonoperative treatment method based on the minimum invasion by using advanced micro-endoscope and laser. By using micro-endoscope without incision, it shapes or decompresses escaped disc. Accordingly, the procedure is possible with only local anesthesia and has a merit of a short procedure time of less than 30 minutes. SELD nonoperative treatment method is suitable for elderly disc patients or those suffering from high blood pressure or diabetes. The SELD nerve decompression procedure helps elderly patients ease recovery burden after treatment and patients suffering from high blood pressure or diabetes can receive safe treatment without risk of bleeding or a rise in blood pressure. While staying at the Jookjeon Yes Hospital, the U.S. medical team observed the SELD procedure conducted by Spine Center head, Dr. Jeon Jae-Kyun, several times and paid keen interest to the Yes Hospital's excellent medical technology by casting various questions after the procedure. "SELD procedure is a fundamental nonoperative treatment method by securing the view necessary for treatment through advanced micro-endoscope and carrying out detailed treatment with laser," Chief Surgeon Jeon Jae-Kyun said." "It has a merit of an outstanding effect like a surgery and a rapid recovery speed so that it is regarded as an effective treatment method for patients suffering from disc"
Dr. Jeon Jae-Kyun is an authority on the spine surgery field. He was registered on the world's top three biographical directories in recognition of his announcement of a number of clinical papers while serving as professor of Kyunghee University Hospital and Seoul Baik Hospital in the past. Thanks to such reputation and affluent experiences in the SELD procedure, many medical teams from foreign countries visited the Yes Hospital to observe the procedure and receive education, engaging in brisk medical exchanges. The foreign medical teams include the ones from Johns Hopkins University of the U.S., and others from China, Greece, and Dubai. Jookjeon Yes Hospital is a foreign patients-attracting hospital approved by the Ministry of Health and Welfare. With the patient-first humanism and a medical service system for a certain treatment, it is a hospital equipped with all processors for visiting foreign patients suffering from spine, joint, and pain.